Every year I create a list of things I’m personally and professionally grateful for. The personal list is down below and I gotta say, I nailed it this year. Moving on to professional list, I work with small business owners and lets be honest with ourselves – small business owners are always looking to save some money and marketing is where they’re always looking to save it. Let’s see how far you can stretch those dollars! Create Instructional Videos. Video content is really valuable, and while it can cost big bucks to get professional YouTube videos produced, there’s nothing wrong with giving it a shot yourself or hiring a film student off Craigslist. Get Ad Promo Credits. While massive ad campaigns may be out of your budget, there are often discounts and coupons floating around for paid Facebook ads or Google ads. Some web hosting services offer advertising discount codes as part of their membership offerings. Check and see if yours does – I bet it does. Lounge About on LinkedIn. LinkedIn is a major social media site that is often under-utilized. Don’t just add network connections and sign out – join groups, enter into dialogue with connections, and share your blog posts. There’s a ton happening on LinkedIn, and it can be a great place to promote your content, share ideas, and build your brand. Develop a Customer Referral Program. Offer existing customers a free product, free month of service, or some other reward for referring new customers. Remember, word-of-mouth is powerful stuff, so friends telling friends about your business is incredibly valuable. Online Contests. You’ll need to cough up some dough for a prize, but the number of participants and new potential leads you get will be well worth the price. Industry Partnerships. Team up with a business related to your industry (but not a direct competitor) for a joint project. This can be done locally offline through some kind of special event, or online with a webinar or promotional giveaway. Apply Online for Business Awards. Most industries have business awards you can win, providing you with an online badge you can place on your website. Badges like these can boost credibility, and as a result, increase sales. Awesome Business Cards. Get yourself some snazzy business cards, then give them to every person you lay eyes on. Every handshake should come with a business card. The more people who find out about your business, the better – even if it’s just a quick glance at a business card. Email Marketing. Get new website visitors to sign up for your newsletter by offering a bonus content piece for subscribing (e.g. get your free ebook detailing how to make a homemade pizza when you sign up for our First Slice newsletter). Slowly nurture your subscribers via email until they are ready to become paying customers. Start your email campaigns with a free email marketing service like MailChimp. Donate Balloons to Local Events. Get a few hundred custom balloons printed with your business name, rent a helium tank, and watch the smiles roll in. You’ll have a bunch of happy people marching around with your brand floating above their heads. My slightly blasphemous Golden Girls religious candles. My seemly endless collection of superhero t-shirts. The $1, $2, $3 section in the front of Target. Shonda Rhimes (even though Scandal can totally be better this final season). Those 30 second social media sped up cooking videos that make me feel like I can cook anything. A fiancé that is a college English teacher that catches all the mistakes spell check misses (damn you, spell check). Cat videos where the cat jumps from one couch to the other, misses and then falls (God, I hate cats). The fact that sweetener packets can be used as makeshift floss – in a pinch. When Jeep drivers do that little wave to each other, but then see me looking at them waving at each other and then wave at me out of pity because I don’t drive a Jeep. Last, but not least, you know I fancy myself emotionless, but Thanksgiving is the one time a year my heart thaws and I allow myself to gush a bit. 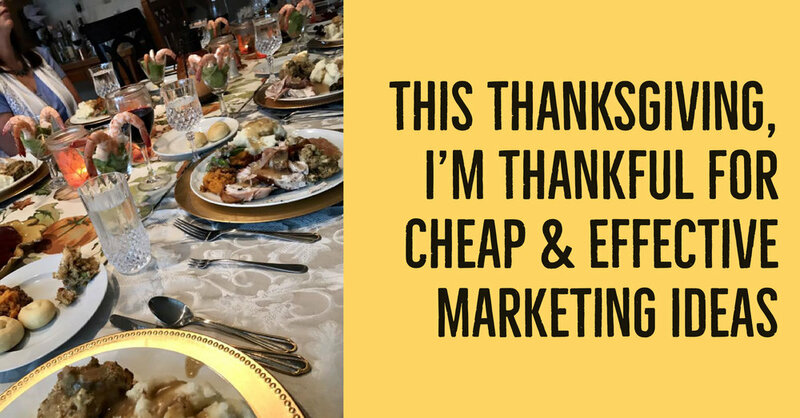 I’m grateful for the couple thousand of you CNY business owners that subscribe to and take the time to read this little blog, and I hope I am delivering on my goal to provide you with free, actionable marketing advice that isn’t overly complicated and maybe (just maybe) puts a smile on your face.